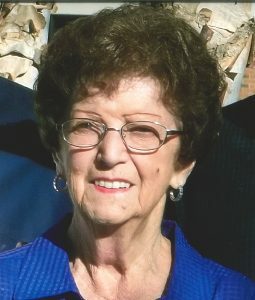 Born February 27, 1938 in Bath, Michigan passed away Tuesday, March 19, 2019, at home in a peaceful sleep and went to be with her Lord and Savior Jesus Christ. Bea was a graduate of Holt High School in 1956. She is survived her loving husband of 60 years, Nathaniel Terry; sons, Craig (Brenda) Terry and Tim Terry; the late Tamara Beth; grandchildren, Erinn (Brent Wilson) Dennany, Shane (Nichole Curtis) Dennany, and Amy Terry; and sisters, Joyce Fuentes and Arlene (Tom) Jenkins. Beatrice loved bowling, traveling, and Bingo. She was a longtime member of Holt United Methodist Church and was retired from M.S.U. Department of Psychiatry following 25 years of service. Funeral services will be held at 12:00 p.m. on Monday, March 25, 2019, at the Estes-Leadley Holt/Delhi Chapel with the Rev. Mark Erbes officiating. Interment will follow at Maple Ridge Cemetery. The family will receive friends at the funeral home on Monday for one hour prior to the service. Memorial contributions, in loving memory of Beatrice, may be made to the Holt Methodist Women. My heart aches for you all. Beatrice was an amazing mother and friend to all. She is a true gem. She always gave so much love and her kindness to everyone. May you rejoice with your amazing daughter in the beauty of heavens home. Will miss you dearly. Til we meet again love you. I was sad to hear of Bea’s passing and wanted to express my heartfelt condolences for the Terry family. Both Bea and Tammy have been a part of my life for over 40 years. I will forever be grateful for the memories of both Bea and Tammy. They were two very special ladies and will be missed immensely. I hope that you find comfort knowing that Bea is now with her beloved daughter in eternal peace. Bea thank you for sharing such a beautiful life! What a terrific lady and someone I’m proud to call “friend.” Always quick with a smile and a kind word. One of the sweetest people I know. She may be gone but will always be a special memory held close to my heart.